Guy Peskett, the son of a surgeon, trained as a chartered accountant. He enlisted as a second lieutenant in 1915 and was killed on the first day of the Battle of Bullecourt. Guy Eastcott Harry Peskett was born at Oakover, Berrow Road, Burnham-on-Sea on 10 September 1888, the second child of Arthur William Chalmers Peskett (1857–1912) and Edith Jane Peskett (1858–1925). Arthur Peskett had been born in Simla, in northern India, where his father was a surgeon-major in the Indian Army. Following his father’s death in 1870, the family returned to England and settled in Southsea, Hampshire. Arthur graduated from Downing College, Cambridge University in 1879 and was then house physician at the London Hospital, before working at hospitals at Burnham- on-Sea, then at Nottingham and finally at Brighton. In December 1885, Arthur married his cousin Edith before moving to Burnham-on-Sea in Somerset, where the first six of their ten children were born, including Guy. Guy’s second name comes from his father’s step-father, George Eastcott Spickernell, a schoolmaster who married Guy’s widowed grandmother in 1873. Guy was initially educated at St Helen’s College in Clarendon Road, Southsea, followed by the Royal Naval School at Lee-on-the Solent, Hampshire. Despite its name, the school had no formal connection to the Royal Navy and later changed its name to Edinburgh House School, before moving to Barton-on-Sea where it eventually became part of The Ballard School. In September 1902, he was admitted to Nottingham High School, where he stayed for a year before completing his education at the Brighton, Hove & Sussex Grammar School. He served as an articled clerk for five years with William Hill Hunter FCA at his offices at 3 North Street, Brighton, passing his intermediate and final examinations as a chartered accountant before being admitted as an Associate of the Institute of Chartered Accountants in February 1911. At the time of the 1911 census, 22 year old Guy had just qualified as a chartered accountant and was lodging with Lewis and Sophia Cooke at 18 Hampstead Road, Preston in Brighton. Shortly after this, he moved to London where he was employed by Messrs Harber, Sturges & Fraser of Guildhall Chambers, Basinghall Street in the City of London, before joining the accountant’s offices of Anglo-Mexican Petroleum Company (later part of Shell-Mex) at 16, Finsbury Circus, London, EC2. Arthur Peskett was a freemason, who joined various lodges as he moved around the country. He was initiated into Phoenix Lodge No 319 at Portsmouth on 24 January 1883 (aged25), resigning in 1890. In March 1886, he joined Rural Philanthropic Lodge No 367 at Highbridge, Somerset, from which he resigned in June 1895. In September 1894, he joined Royal Sussex Lodge No 402, meeting in Nottingham, resigning in December 1903. He then appears to have spent eighteen months unattached, before joining Hova Ecclesia Lodge No 1466 at Brighton in May 1905. Guy followed his father into Hova Ecclesia Lodge, where he was initiated on 11 May 1911. The lodge records show him now living at Ilford, in East London. Guy was passed to the second degree on 14 December and raised to the degree of master mason on 8 February 1912. By the time of his death, he had reached the rank of junior deacon. Guy’s principal while he was an articled clerk, William Hill Hunter, was also a freemason, having been initiated into Royal York Lodge No 315 in October 1911, and joining Sussex Masters Lodge No 3672 in June 1918. Guy enlisted on 16 October 1915 and was immediately commissioned into the 2/4th Battalion of the Duke of Wellington’s (West Riding Regiment). The battalion had been formed at Halifax in September 1914 as a home service (“second line”) unit, and was based at Retford in Nottinghamshire in October 1915 as part of the 186th Brigade in 62nd (2nd West Riding) Division. In November 1915, the battalion moved to Newcastle, and then in January 1916 to Salisbury Plain, moving to Halesworth in Suffolk in June and to Bedford in October, before being shipped to France, from Southampton to Le Havre, where they arrived on 10 January 1917. By 18 January, the battalion had arrived in the Third Army area between the rivers Canche and Authie. In February, the battalion was involved in the operations on the Ancre around Beaumont-Hamel and then in the German retreat to the Hindenburg Line in March, culminating in the captures of Bapaume and Peronne. On 10/11 April, the 62nd Division was involved in the first, unsuccessful attempt to capture the village of Bullecourt, 20km south-east of Arras. During the next three weeks, the 62nd Division was engaged in trench warfare and in preparing for the next assault on the Hindenburg Line, before receiving orders to re-launch the attack on Bullecourt on 3 May. The assault had been preceded by a heavy artillery bombardment and by the time of the attack, the village itself had been destroyed. Nonetheless, the German army put up strong resistance, but eventually the enemy was pushed out of the village, with great loss of life on both sides. 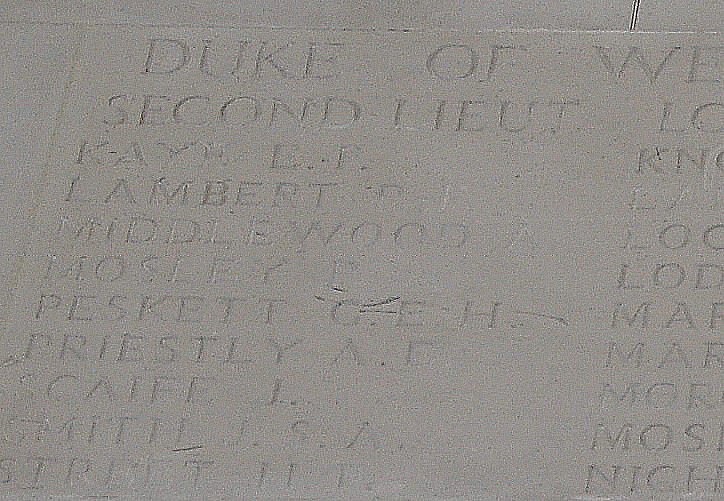 Lieutenant Guy Peskett was reported missing in action on the first day of the battle, and was one of nearly 500 men of the Duke of Wellington’s (West Riding Regiment) killed on 3 May 1917. In March 1918, Guy’s mother was formally notified that he was now presumed dead. As his body was never recovered, he is one of nearly 35,000 men commemorated on the Arras Memorial in the Faubourg-d’Amiens Cemetery at Arras. 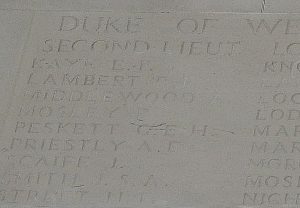 He is also remembered on the war memorials at Brighton and in East Hoathly, near to his parents’ home at “Simla” in the small village of Halland, and on the war memorial at Brighton & Hove Grammar School, as well as on the Masonic Roll of Honour. Guy’s younger brother Jack (1895–1941) was a Captain in the Royal Sussex Regiment during the war; he served in Palestine and France and was awarded the Military Cross and Croix de Guerre. Guy’s father had died in November 1912, while his mother died in March 1925. Guy never married.